I am having the same issue, as you’ve already noted. If you have any updates please let me know! I have a client that wants what I’ve done in flash put into a Powerpoint presentation and being that I’m working with CS3, Powerpoint will not recognize the swf. I have been trying to use SnapZ to capture the swf as a quicktime movie, but the end result is choppy. I’m glad I’m not alone here. Brian — I would just try using the “After time elapsed” setting and then editing the video to remove any extra length. This can be done really quickly in QuickTime Pro. It is an annoyance, but it works. I just had the same problem, you rescued my day! The weird thing is that the very first time I used the export, it worked without making that change. I suppose there will be an update coming at some point…. The interesting thing is that the very first time I tried exporting, it worked without making the change to specific time. I guess we’ll be seeing an update soon…. So far this issue pretty much describes my overall enjoyment of CS3. Overpromised, overpriced, and time consuming as all get out. Thanks for the tip. It exports and looks fine in Quicktime player but for some reason Final Cut Pro keeps seeing it as a 10fps movie instead of the 25 fps I specified. Strange. “When last frame is reached” will only work if the last frame is actually reached. So make sure you don’t have a stop() action in your main time line that prevents the play head from getting there. I always have a stop action or two in there to prevent the movie from looping, and that was my problem. 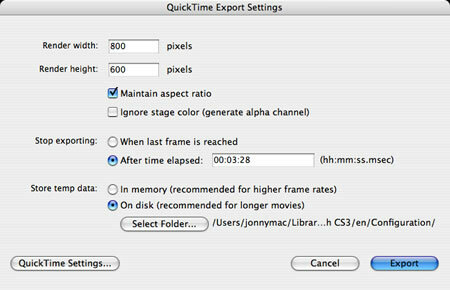 Using the “Quicktime Settings….” tab and switching to Sorenson, with a specific type of screen setting will solve this problem as well. As mentioned above, a stop(), will inhibit the export. Playing with Quicktime’s compression settings has solved this issue for me. I’ve exported to broadcast quality without a problem. Thanks so much for that tip – I was teasing my hair out wondering why the export was locking up, and this fixed the issue. just saved me too for a class project. thanks! I am working on a Flash CS3 presentation (screen show) that I need to export as a QuickTime movie that will be run on a DVR to be displayed on a HDTV. I’ve been trying to test out the process before I complete the whole project to make sure this will work but each time I try exporting as a .MOV then open the file in QuickTime, nothing is there, just a blank white screen. I have to use the Export method rather than Publish, because it is a Flash presentation. If anyone has any ideas, I would appreciate it. Thanks! Genius! Thanks for posting this. It only took me 5 hours to find this solution. put a empty frame after last frame, and then it stop when it goes there instead of the frame containing a clip? Thanks! I had captured the movie using SnapzPro, and it worked but due to the 12fps of the project, Final Cut and Motion weren’t able to use the files right (either cutting off the clip before it was actually over, or converting to 29.97 fps which caused a pause every few seconds). Thank you soooo much for writing this down and sharing with others! I have had this problem (kid you not) for over 2 flippin’ weeks!!! Thanks!!!! Anyone who knows why this is?? you don’t have to resort to calculating the total time of the clip based on the number or frames. and it doesn’t matter whether you have a “stop();” action in there or not. the solution to this problem is to make sure all layers in the timeline end on the same frame. that ‘s all you need to do. Hi and thanks for this helpful post. I have a similar problem – bu ‘m a complete newbi to Flash. I have imported a designer’s flash file and I need to get it into Premiere Pro. I’ve made my changes and it previews fine in F12 preview. But I cannot fof the life of me export to AVI or MOV. I’ve tried all settings options and all I get is the first frame. Seems to take no time at all to convert/save the file and I can import it, but it is just the single frame. WHen I hover the mouse over the file it shows it as a video clip but the duration is 00:00:00 ANy help would b greatly Appreciated. Just wanted to echo everyone else’s thanks – you just saved me from hours of frustration. THANK YOU SOOO MUCH!!! i deleted the stop actions from my flash doc and the video exported right away!!! SAVED ME SO MUCH TIME!!! So here’s a question… if i can’t put the stop actions in how can i prevent the movie from looping? is their a setting somewhere that i can set what frame it ends at? Found this after hours of searching…I hope the more we visit this, the more Google will bump it to the top. THANK YOU! Thank you! You just saved me countless hours of frustration. Thank you, thank you, THANK YOU! Flash was giving me this problem less than 12 hours before a critical campaign pitch. Your solution worked great. Thank you so much! Many, many thanks. It works! At first I took a larger time setting, played the movie in Quicktime. Quicktime indicates the exact time. So I exported the fla. again, now in the right time. This way I prevented looping. Works Great! Been trying to figure that out for a year now!